The Naturally Trendy Stone-Live the EXPERIENCE with us. Welcome to LivingRoc USA & Canada, the online experience for buying natural trendy stone products. Discover our unique selection of trendy and ecological products: stone vessel sinks for the bathroom, polish and honed black and gray granite and more with our kitchen farmhouse sinks, outdoor patio and indoor stone tables in slate and travertine mosaic tables. Enjoy our exceptional materials in our Bathroom, Outdoor Patio, Kitchen, Living and Dining Room areas. Can you imagine transforming your home into a beautiful creation. Here are some of our online products. 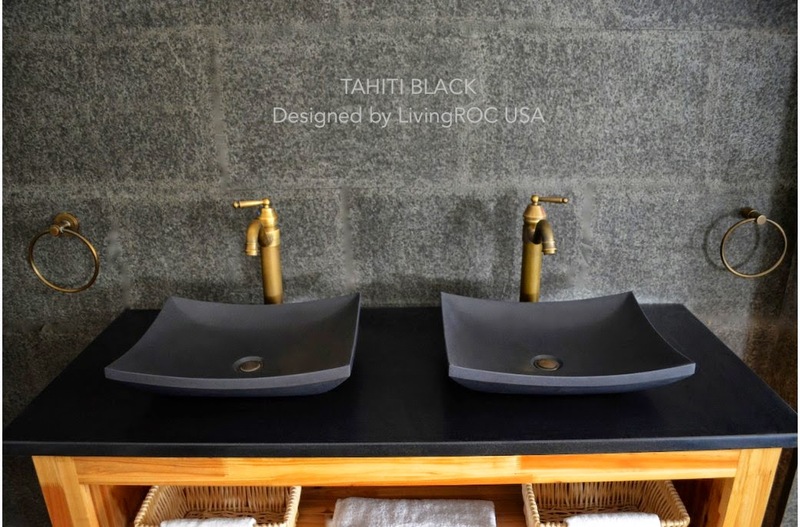 Made in mongolia black basalt the TAHITI BLACK will bring elegant originality to your surroundings. If you wish to standardize your project you can choose among a wide range of our shanxi pure black granite shower trays carved from the same material. 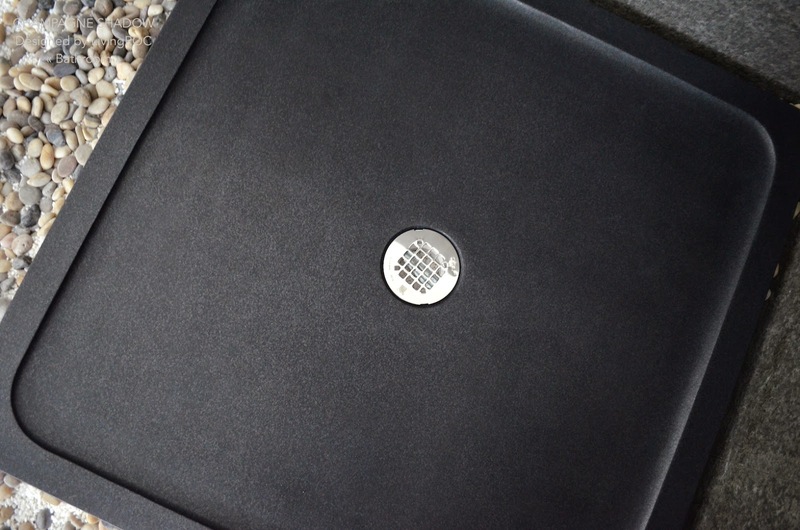 Could you imagine one day installing a shower pan made from the purest grade of Black Granite in the world, sought after by specialist around the world. CHAMPAGNE SHADOW is a perfect for transforming your bathroom into an oasis. Next is our Outdoor patio and Dining area. Spring is here and why not imagine relaxing in your backyard with one of our Outdoor & Garden Patio tables. Here is our LUXOR patio table seduced by the meeting of two noble materials that spanish marble and Egyptian beige galala. 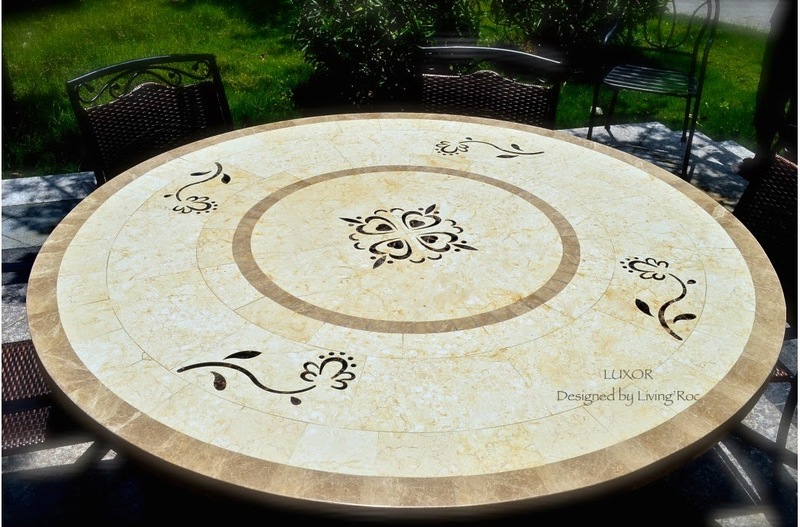 Accommodating up to 10 guests for this round 63" patio table will be the envy of your guests. 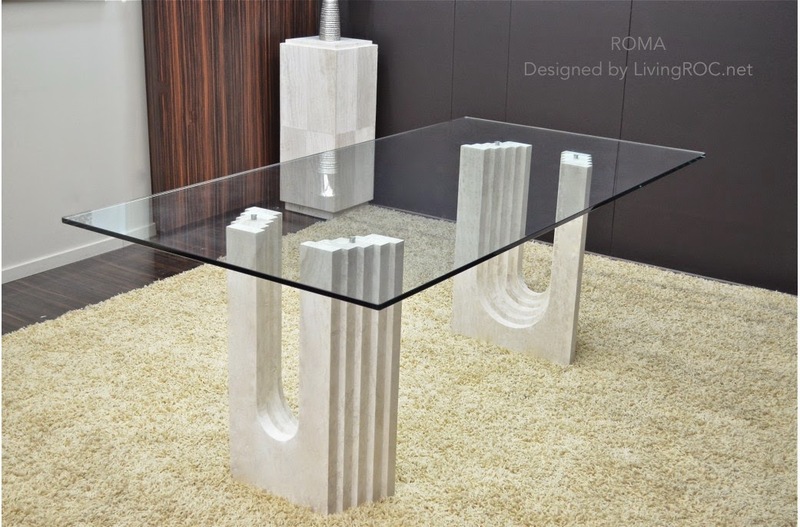 You will find on our site a very wide choice of natural stone and glass dining room tables. Our outstanding range is the creation of a group of talented masons who are working the marble travertine from scratch, then carefully assembled. The strength of the Travertine marble and smooth curves combining together to create a harmonious blend of stone and glass, will enhance your room, making it unique and elegant. Welcome to our Aquadeos kitchen area one of our favorite at LivingRoc. You will find in the kitchen universe has a wide range of single or double kitchen sinks with or without a drying rack. 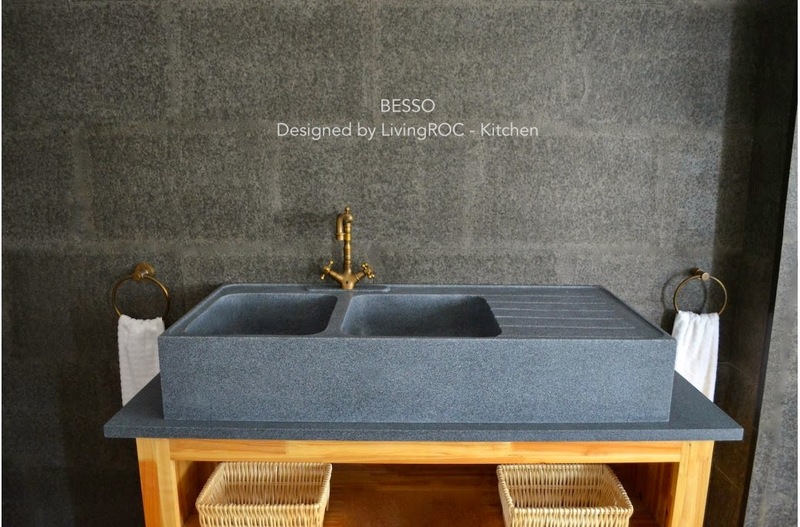 The BESSO kitchen sink is a double bowl farmhouse style kitchen sink with a large drying rack made in gray granite. The natural stone farmhouse kitchen sink has been designed to last a very long time, giving you a great level of resistance and easy maintenance. 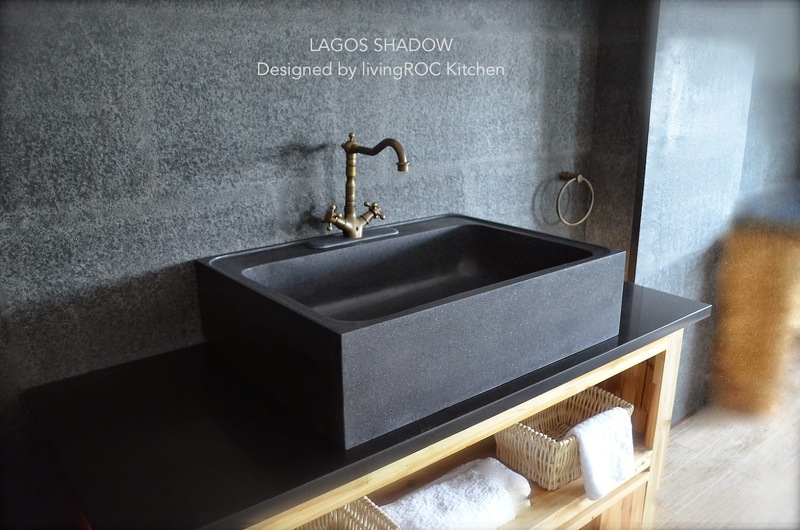 LAGOS SHADOW farmhouse kitchen sink in Shanxi black granite. With its large single tank, slightly inclined as to not hold water. We have selected only the most beautiful stones, highly resistant to chipping and scratching can withstand hot temperatures and tolerant to high temperature changes.